Product segmentation is a now a regular phrase in everyday airline discourse, but in reality is that the strategy remains immature at the large US global airlines. American, Delta and United are working to drive revenue from fare segmentation and Delta is more advanced in its roll-out of segmented fares, having introduced a version of basic economy in 2011. Delta recently offered some insight into its product segmentation evolution and the progress it has made in improving the way it monetises premium products. The result is that premium seating revenue growth has outpaced main cabin growth during the last few years. One of Delta’s important ongoing tasks of its product segmentation is ensuring that its various fare offerings are available across multiple channels. Broadening the reach of segmented fares in those channels could be worth millions to Delta. Delta pushes up paid load factor in domestic first class. The spreads between Delta’s segmented fares are not high, and the airline has a new policy that allows for buy-ups using miles post-purchase. Delta is working to expand exposure of its product portfolio in external channels. Delta launched a basic economy product on selected routes in 2011 to compete more effectively with the ultra low cost carrier Spirit Airlines. Since that time Delta, along with its large US global network airline peers American and United, has created fare classes that in essence cater to a range of passengers – from the cost conscious infrequent traveller to the high yielding business passengers. All three of those airlines frequently tout the millions in revenue that fare segmentation will generate, but Delta recently offered insight into the growth of premium revenue resulting from both the expansion of premium seats and improving the way it sells those products. Company executives recently explained that back in 2011 only 9% of its seats fell into the premium category, and the airline's management acknowledged that it didn’t sell those seats very well, noting that its premium product in the US domestic system was a loss leader. At that time Delta’s paid first class load factor was 13%, even as that section of the cabin was always full. By 2018 Delta’s paid first class load factor domestically was 60%, and the main cabin represented less than half of its revenue. In 2011, coach class represented two thirds of its revenue. Since 2011 Delta’s product line has evolved into five distinct fares – basic economy, Main Cabin Comfort Plus, Premium Select and the Delta One class. However, illustrating the time it takes to refine and deploy various fare classes across its fleet, Delta’s first widebody aircraft featuring all five fare options only debuted in late 2018. 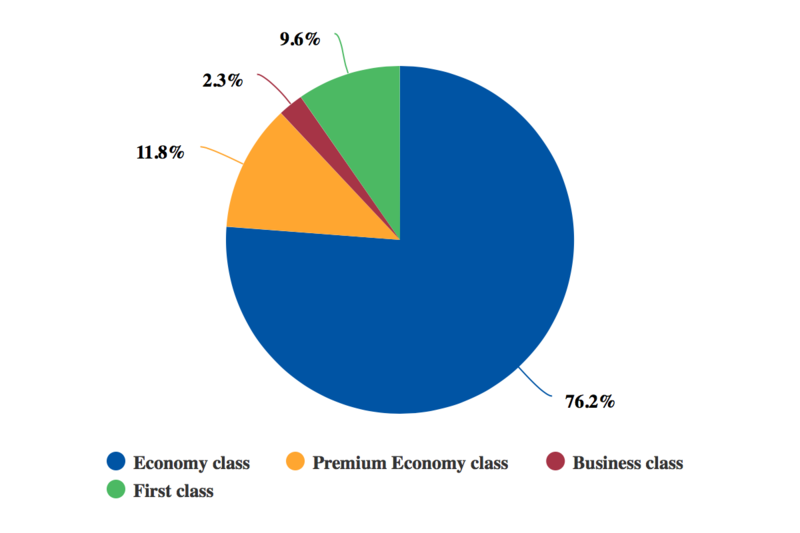 Data from CAPA and OAG show that as of late Jan-2019 first and business class represented approximately 12% of Delta’s weekly system seats, and premium economy represented a similar amount. But Delta is projecting that its premium seats on offer will reach 30% by 2023; the airline is stressing that fares for premium products have moved in different directions during the past few years. Airline executives have said that the upsale amounts between the fare classes are not significant, noting that the average buy-up to Comfort Plus from Main Cabin in the domestic system ranges from USD35 to USD40. In the 2010-2011 period the multiplication factor of a Delta first class fare above a coach fare in the domestic system was broadly 5.5x. “No wonder our paid low factor was low”, one Delta executive stated. “…That difference was huge and very few people were willing to pay for it”. Delta has also adopted a new policy by which customers can use their frequent flyer miles as currency, which means passengers whose companies do not have premium policies built into their travel guidance have the ability to buy up to those products. The airline has registered that during the first month of allowing customers to redeem miles for post-purchase upgrades it recorded more than 30,000 upgrades, which drove a 2.5 point increase in upsales on its website. One of the next phases of Delta’s evolution in fare segmentation is working to ensure that its range of offerings is available through external channels. The airline's view is that it has done a good job in building the functionality to support segmented fares on its own website, but transferring that capability to external retail channels is – unsurprisingly – more of a challenge. There has been some progress on the corporate side, with 100 corporate and business customers adding premium products to their travel policies during the past year. Delta has culled some data about premium product purchasing patterns on its own site and external channels, calculating that 20% of customers using delta.com purchase premium products. That compares with 10% via corporate channels and 5% through online travel agencies. The airline believes that every point of improvement in customers buying products through premium channels is ultimately worth USD400 million to USD500 million. Delta is not alone in working to expand its segmented products beyond its own website. Successful revenue generation from branded fares depends on reaching customers using corporate websites and online travel channels. The airline's own estimates for improving the exposure of segmented fares in external channels shows the importance of the strategy for airlines that are aiming to capitalise on branded fares: ensuring that those products gain ample representation beyond their own storefronts.